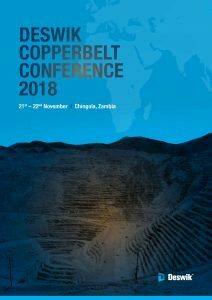 We are pleased to invite our current clients and interested parties from the Copperbelt region to attend our 2018 Deswik Copperbelt Conference in Chingola. The forum will attract mining representatives from throughout Zambia and the Democratic Republic of Congo to see first-hand the value Deswik’s applications offer the Copperbelt region. The event will provide opportunities to interact and network with experienced mining professionals and Deswik users. Discover how to increase efficiency and reduce risks in mining while learning from experienced mining professionals through informative presentations and focused group-based workshops. To register, contact our Johannesburg office.